Yesterday afternoon, Zak made a trip to the local Asian grocer and returned with a few treats, including the shirataki noodles that make up the main component of this stir fry. I had never worked with them before, so I did some Googling to get some tips. Apparently, some people feel that the noodles have a very strong and unpleasant taste if not parboiled for 2-3 minutes first (the package recommends doing this if you don’t like the “authentic flavor”). I didn’t do this, because I wanted to know what the “authentic flavor” was before I decided whether to get rid of it in the future or not. I tasted a raw noodle and it seemed pretty good so I figured what the heck. Others recommended marinating the noodles, which I did do (I was going to be making a sauce, anyway). Honestly, I thought these noodles were absolutely delicious and didn’t notice any flavors that might be considered off-putting or weird. They absorbed the flavors of the sauce beautifully. The did have a slightly “gummy” texture (as do the nián gāo), but I enjoyed it, as it added another layer of texture to the dish. I also found out that the noodles are very healthy due to the high amount of water-soluble dietary fiber, which has been linked to reductions in blood cholesterol, and only has 20 calories per serving. The nián gāo, or rice cakes, are flat discs formed from glutinous rice that can be found at an Asian supermarket and perhaps other specialty food shops or groceries with a large “ethnic” section. 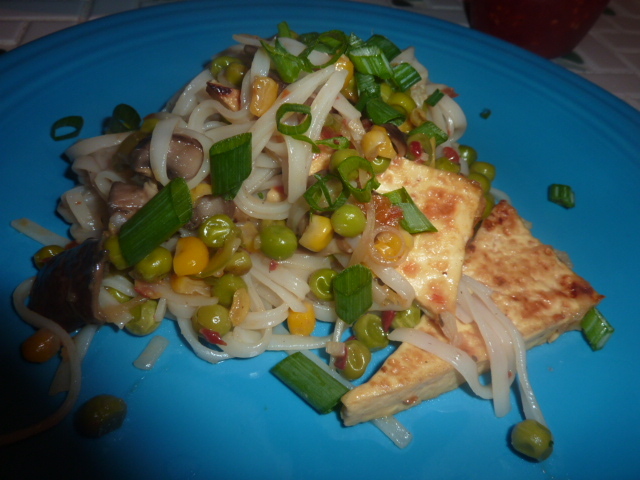 I will certainly be using the shirataki noodles again, because this dish was extremely healthy and extremely flavorful. Substitute the clam juice and fish sauce with vegetable broth or water and the honey with brown sugar you’ll have a vegan entrée on your hands. This stir fry is very fast and easy. As always with a stir fry, make sure you do your mise en place first, as the stir fry comes together very quickly. This dish is quite spicy, so if you are a spice wimp, use only one jalapeño and less garlic chili sauce in the marinade. Thoroughly rinse noodles with cold water 3-4 times. Let drain. Mix together claim juice, soy sauce, fish sauce, chili garlic sauce and honey. Add noodles and let marinate at least one hour. Drain noodles, reserving marinade, as it will constitute the sauce for the stir fry. Drain tofu by placing between a layer of paper towels and topping with a heavy cast iron skillet or sauté pan weighted down for at least 30 minutes. Cut into 1/2″ cubes. Meanwhile, bring a small pot of water to a boil. Rinse tofu cakes throughly under cold water and boil for thirty seconds or until they float. Set aside. Heat reserved shirataki marinade in a small saucepan over medium heat. In a small bowl, whisk together cornstarch and cold water until it forms a slurry with no lumps. When the marinade is heated through, slowly add the cornstarch slurry a bit at a time and whisk until thickened. Remove from heat and set aside. Heat corn oil in a medium wok over high heat. Add ginger and garlic and sauté until fragrant, about 1-2 minutes. Add drained shirataki noodles and cook 5-6 minutes. Remove noodles from wok and set aside. There is no need to remove all of the ginger/garlic from the wok. If necessary, add more corn oil. Add tofu, mushrooms, jalapeños, and broccoli florets. 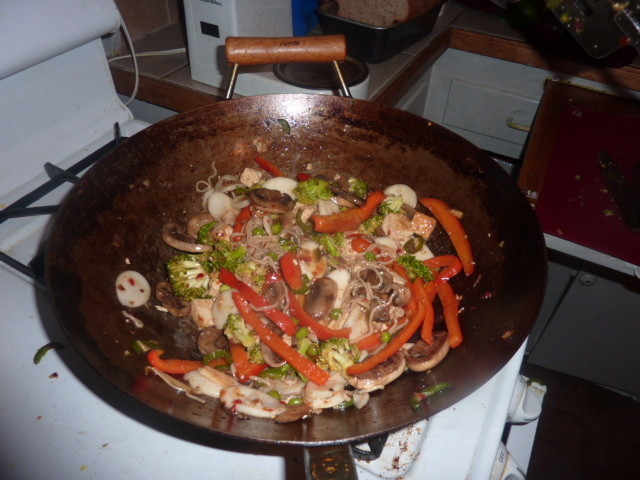 Tossing frequently, cook in the wok 3-5 minutes until vegetables are tender. Add red peppers and peas and sauté, tossing frequently, until tender, 2-3 minutes. Add noodles back to the wok. Add rice cakes, reserved sauce, and sesame seeds and toss thoroughly to combine. Let heat through roughly 1-2 minutes. Serve immediately.